I take inspiration from my different eating experiences, whether it be at a tapas bar or the local hawkers, or from reading TanHsuehYun’s blogs. I still have a newpaper cutting of her Gochujang chicken recipe, tempting me with its the charred edges & shiny deliciousness! a) this dish is about a good marinade, the right combination of sauce & spice, then enough time to soak it in, about an hour. A little sugar will give this a hint of sweetness and a nice char. 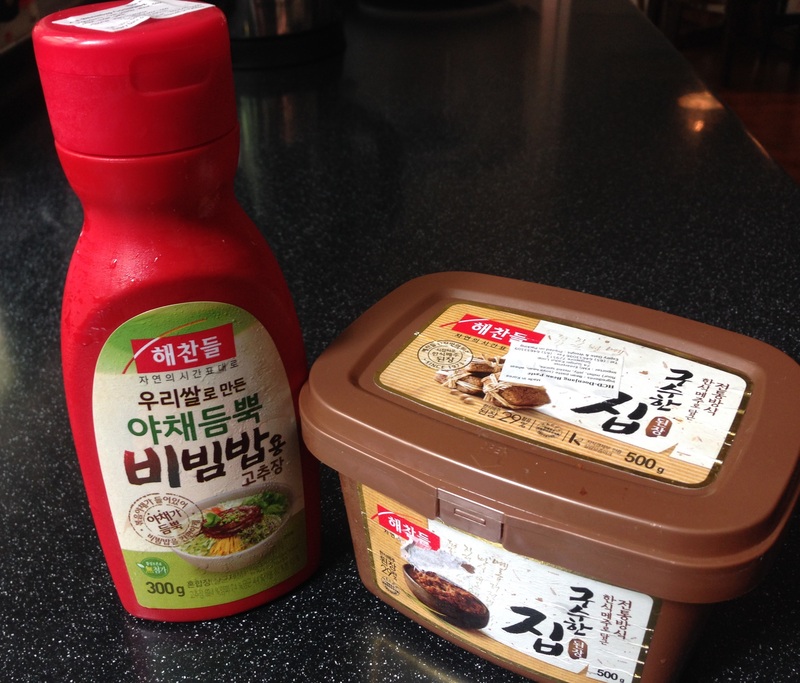 b) Gochujang sauce is made from fermented beans, glutinous rice and sweeteners, but I also have Doenjang bean paste which has a heavier taste. So a mix of each, and I learnt from Mom much earlier in my cooking life, that when using fermented beans (including tau cheo, tau si), also add garlic, some sugar, and soy sauce. I also added a tablespoon of Mirin (a co-ingredient in many miso recipes). Mix everything together and taste, adust then mix and taste again. I want a tablespoon of the marinade for each drumstick. It’s fun, and makes me feel smart like a chemist in a lab, and creative like an artist! c) de-boned chicken drumstick because I love the dark meat of chicken, it stays moist with grilling, skin on of course! And because it’s easy to slice and plate. e) What do I eat this with? Fried rice, noodles tossed in a sauce, in a burger….but nothing soupy. Lucky for me my husband loves to cook and we have his kimchi and green sauce in the refrigerator! Here’s a picture of our dinner, egg noodles in a raw green sauce and Gochujang Chicken with homemade kimchi….give it a try. Create your own recipe today!